No-one obsesses over property quite like the British, even though buying and selling a home can be a personal headache and a financial lucky-dip. British newspapers groan under the weight of property supplements; TV reports constantly track house prices; young people fret about getting on the property ladder, while established homeowners worry about how to increase the value of their home or the market crashing. Buying a property is rarely straightforward and can be very time-consuming. There are numerous choices to make, from the style of building and location, to proximity to schools and other amenities. Most of all, there are plenty of opportunities to make the wrong decisions. Selling your home is also fraught with stress; from deciding to move and evaluating your property’s worth to finding an estate agent and putting your home on the market, every step comes with it’s own difficulties. Plus the advent of the Home Information Packs has also created a new headache for potential vendors. 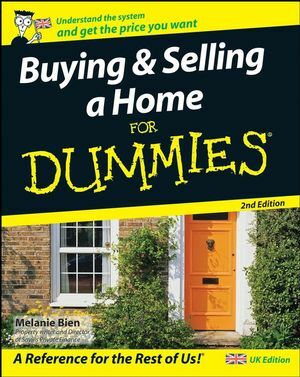 Buying and Selling a Home For Dummies, 2nd Edition covers everything from finding a property and getting a mortgage to preparing your home for sale and moving on. It is also one of the few guides to cover England, Wales and Northern Ireland as separate entitles from Scotland, and to cover the Scottish property market. This updated guide also contains coverage of HIPS (Home Information Packs), which were made compulsory in September 2007 and apply to all properties with three or more bedrooms. Melanie Bien is a property writer and a Director of Savills Private Finance. She is the author of the bestselling Renting Out Your Property For Dummies. Part I: So You Want to Buy Your First Home? Chapter 1: Why Getting Your Foot on the Property Ladder Is a Smart Move. Chapter 2: Deciding Whether You Can Afford to Buy and Getting the Timing Right. Chapter 3: Determining What You Want. Chapter 4: Dealing with Estate Agents. Part II: Finding the Right Property. Chapter 6: Looks Are Everything: Period Homes. Chapter 7: New and Self-Build: No Previous Owners. Chapter 8: Renovating Wrecks: Property In Need of Work. Part III: Making an Offer and Finding the Readies. Chapter 9: Making an Offer: What Happens Next? Chapter 10: Going, Going, Gone: Buying Property at Auction. Chapter 11: Getting a Mortgage. Chapter 12: Insurance: Ignore at Your Peril. Chapter 13: When Money’s Too Tight to Mention: Low Cost Routes to Homeownership. Part IV: Selling Your Home. Chapter 14: Deciding When It’s the Right Time to Sell Your Home. Chapter 15: Creating the Right First Impression. Chapter 16: Using a Pro to Sell Your Home: Getting the Most from Estate Agents. Chapter 17: Going It Alone: Selling Your Property Privately. Chapter 18: Negotiating a Successful Sale. Part V: The Legal Process of Buying and Selling. Chapter 19: Conveyancing for Buyers and Sellers in England, Wales, and Northern Ireland. Chapter 20: The Scottish House-Buying Process. Chapter 21: Selling Your Home in Scotland. Chapter 22: Ten Things for a First-Time Homeowner to Do. Chapter 23: Ten Ways to Sell Your Home. Chapter 24: Ten Tips on Dealing with Estate Agents.